Even the box is designed to be recycled as photo frames! It's Potent! 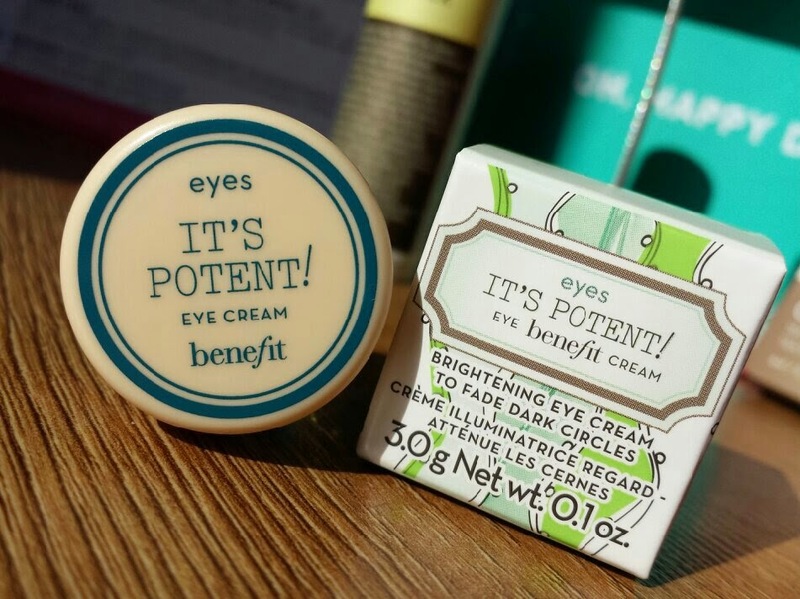 Eye Cream by Benefit is a brightening eye cream and is part of their b.right skincare range. 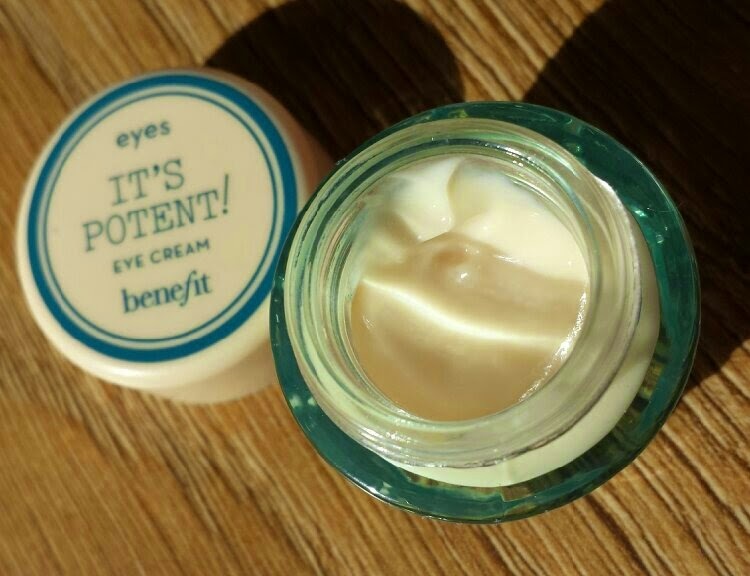 Whilst probably being better known for their makeup, Benefit do have a range of skincare too and this eye cream is a brilliant little product. I have previously written about It's Potent! On my Benefit Brow Bar experience post, but as I didn't explain too much about it I shall say a small bit here. This cream is designed to fade dark circles underneath the eyes. The sample comes packaged in a small glass jar with a beige screw cap lid, which is a miniature version of the larger product. The cream itself is a beige colour. To use, you need to gently dab some product underneath your eyes and massage in. I have actually used this product before, and I have to say that it is pretty good. Dark circles do steadily fade, but as it is a cream based product I don't find that it works too well for me if used in the day time as it can make mascara smudge underneath the eyes. When used just at night, however, it works just as well and over time your eyes do look brighter and less sleepy. 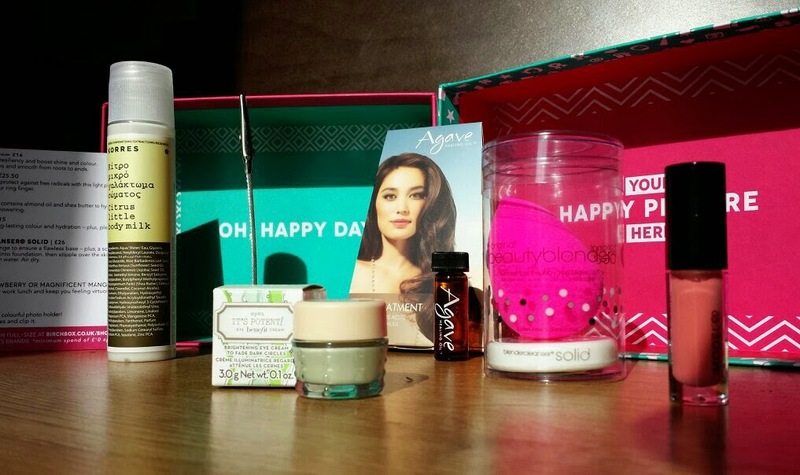 I think it is a great addition to this month's box and I really do believe that a lot of people will enjoy getting the chance to try it out! 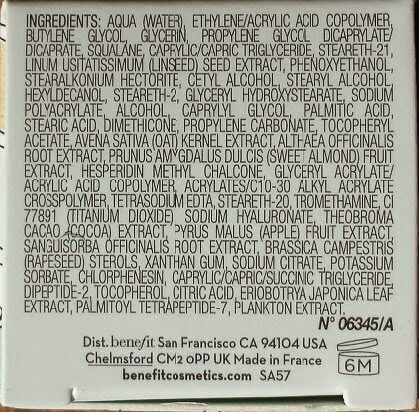 You can buy the full size, 14.2g jar of Benefit It's Potent! 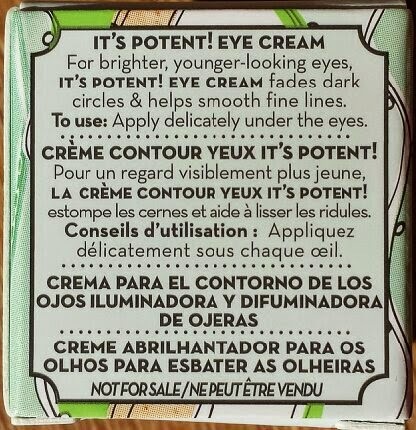 Eye Cream for £25.50 from Birchbox. As much as I would have been excited to try this just a few months back, since I have converted to “no-poo” I can’t use oil in my hair due to the bi-carb not being able to remove it easily from my hair again. Therefore, I have handed this one over to my sister to test out so should have results back soon when I will update straight away. You can buy the full size, 60ml bottle of Agave Healing Oil Treatment from Birchbox, or the bigger 120ml bottle also from Birchbox. 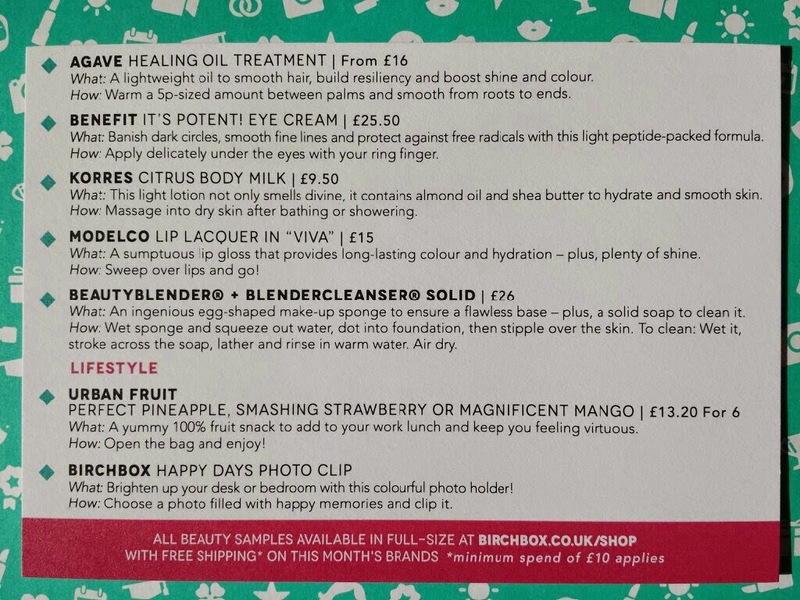 However, at the moment of posting, Birchbox has no prices listed on the website, but the card does state that prices start from £16. ModelCo’s Lip Lacquer in Viva is a highly pigmented, long-wearing lip gloss. 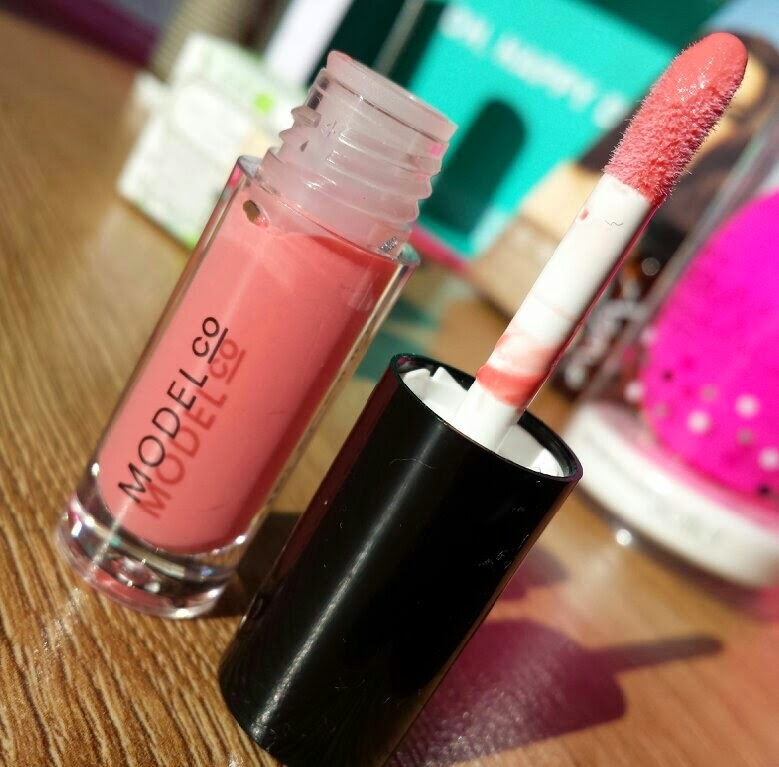 It also claims to be non-sticky and to provide the lips with all-day moisture. This month, Birchbox decided to allow all subscribers the chance to choose which ModelCo product they would most like to test out. We were able to choose between two shades of Lip Lacquer, Viva and Morocco, and the Powerlash Mascara. As you can see, I chose the Lip Lacquer in the shade Viva. Viva is a light pink, peachy shade that is non-glittery. 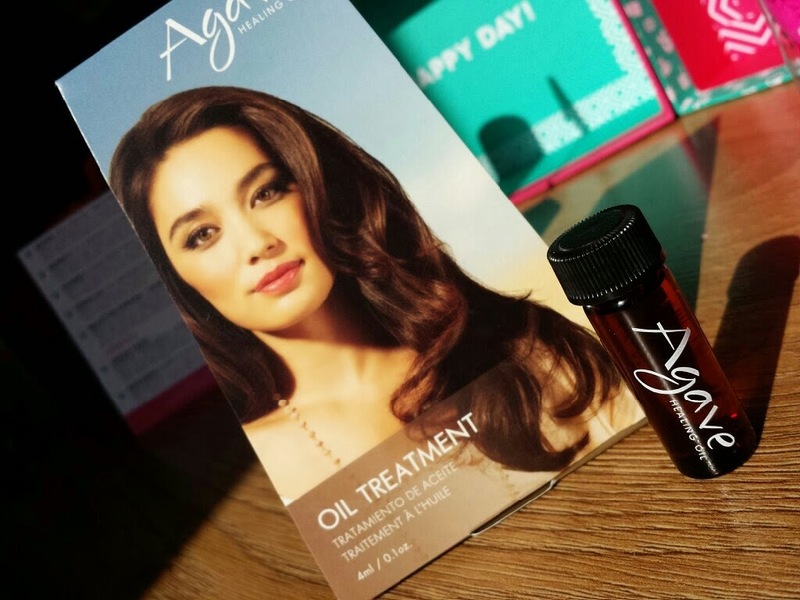 The sample comes packaged in a small, miniature version of the full-size product. It is in a clear, plastic tube with a black screw lid with wand applicator. Using this product is the same as any other wand applicator lip product - use the applicator to spread the gloss across your lips. The coverage of this product is okay, but not as highly pigmented as I first expected. The colour does spread across the lips well though and spreads evenly. It isn’t sticky, and the longevity is pretty average, coming in at a good couple of hours before a necessary re-application. You can purchase the full size ModelCo Lip Lacquer in Viva from Birchbox. Once again, at the time of posting, the website doesn't have a price listed. The card included says that it costs £15. 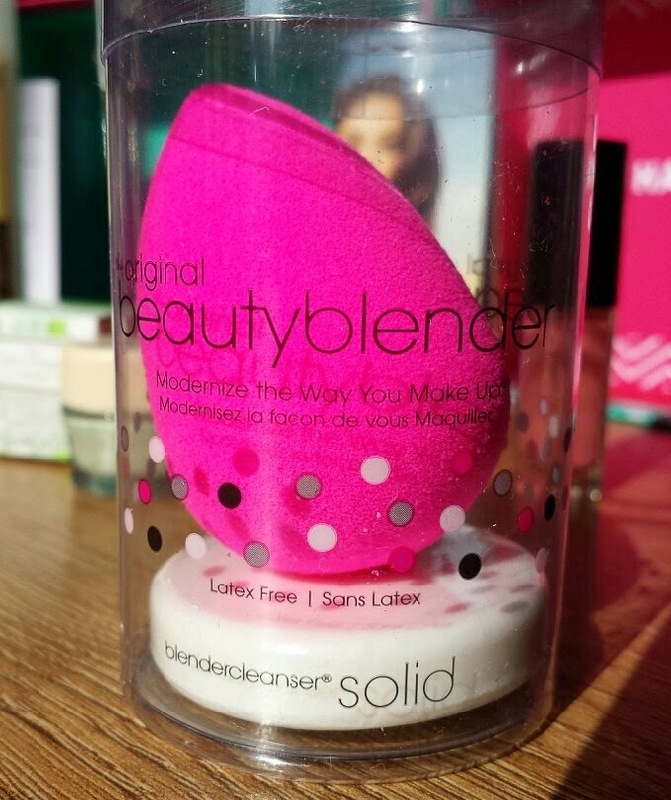 The BeautyBlender is a small, bright pink, egg-shaped sponge that is used for applying foundation, tinted moisturiser, BB cream, CC cream and so on. This set also comes with a solid cleanser bar for cleaning the BeautyBlender. I was super excited to receive the BeautyBlender in my Birchbox this month as I have missed out on it when it has been included in other boxes, instead receiving a different item to it. I have to say that whilst I was typing what I had to say about the BeautyBlender, it got a bit too long for this Birchbox post. Therefore, I have decided to dedicate an entire post to the BeautyBlender, which you can find here. What I will say though is that this product is an amazing addition to the box. I'm so glad to finally receive one, so thanks Birchbox! You can purchase your own BeautyBlender & BeautyCleanser Solid for £26 from Birchbox. 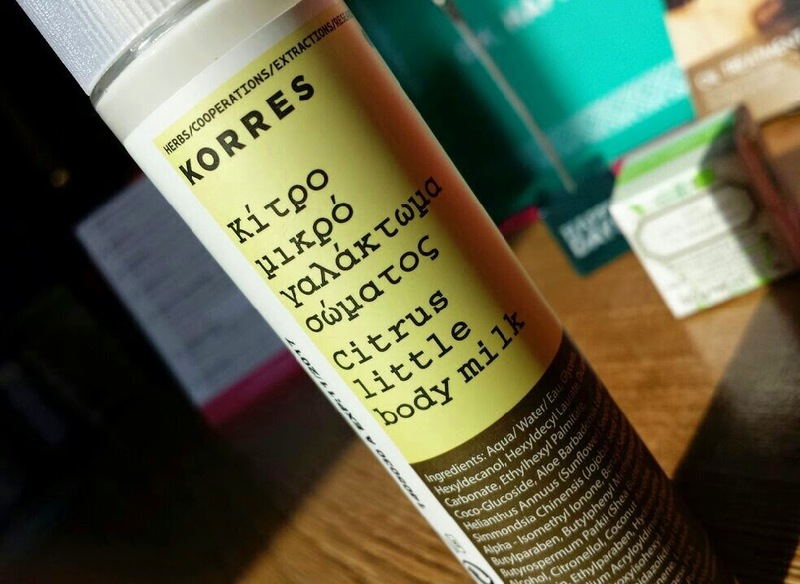 Another product that I was really happy to receive is this - Korres Citrus Body Milk. The body milk contains aloe, almond oil, provitamin B5 and shea butter and it works to leave the skin smooth and nourished. Best used straight after your shower/bath whilst the skin is still damp as this way it helps to maximise hydration. This has been on my ‘want to test’ list for a while, and in fact, it was on my list of things that I was going to purchase next. Korres is a Greek brand who specialise in natural skincare. This is one of the main things that drew me in to wanting to test out this moisturiser. However, even though it is silicone free, mineral oil free, propylene glycol free and ethanolamine free, it isn’t paraben or fragrance free. 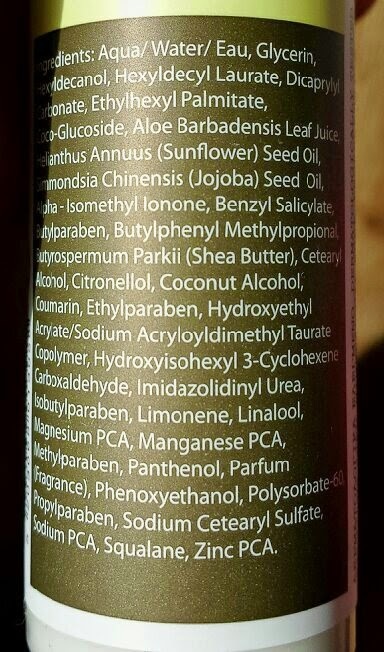 The Birchbox website states that it is paraben free, but the ingredients list states otherwise. The sample comes packaged in a clear, long, screw-cab tube with a sticker containing product info and it holds 50ml of moisturiser. The main packaging is a squeeze tube that holds 200ml of product. The sample packaging can be a little irritating to dispense the cream from as you can’t really squeeze the tube, which is why I wanted to explain that the full-size packaging should be a lot easier to use than the sample. The cream itself if is just off-white, not overly thick and not overly watery in texture. It is watery enough to spread quite far across the skin with minimal effort, meaning that overall you can use less product than you would if you were using a butter, for example. It is also thick enough to not come gushing out of the tube so you use too much. Fragrance wise, this is rather intriguing. It is citrusy, but also slightly masculine. Think of a mens citrus aftershave and you won’t be far off. However, this smell does fade into a fresh, clean scent a short while after application and can only really be smelt if you directly smell your skin. I find the hydration to be fantastic - it is lightweight and lasts all day, so it doesn’t feel at all heavy on the skin and you are left with soft and beautiful skin. It’s a great moisturiser, and one of which I will be purchasing a full-size bottle of. The whole range comes in a wide variety of scents, too, so you can mix it up depending on your mood! They also have matching body washes for each of the scents, but I haven’t gotten around to testing those out yet so I can’t comment on how well they work. 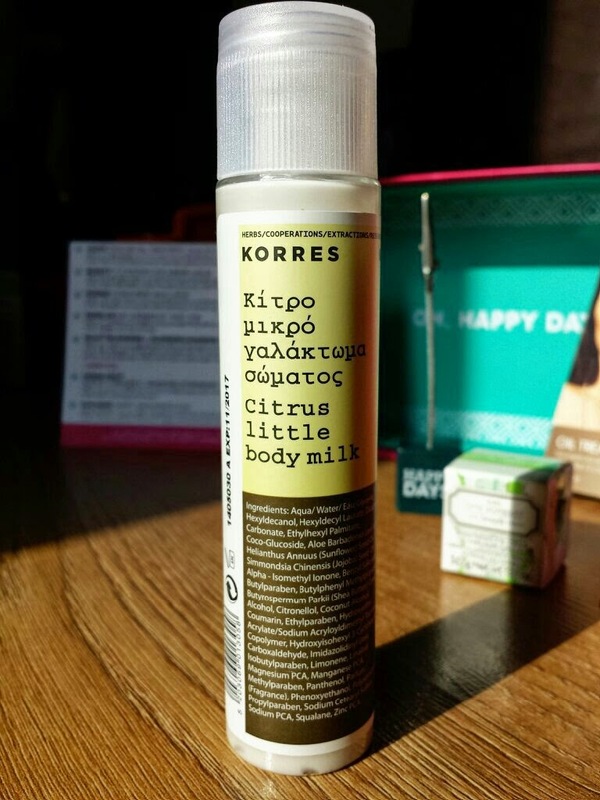 You can buy a full size, 200ml bottle of Korres Citrus Body Milk for £9.50 from Birchbox. To check out other fragrances in the range, check out the Korres brand page on Birchbox here. 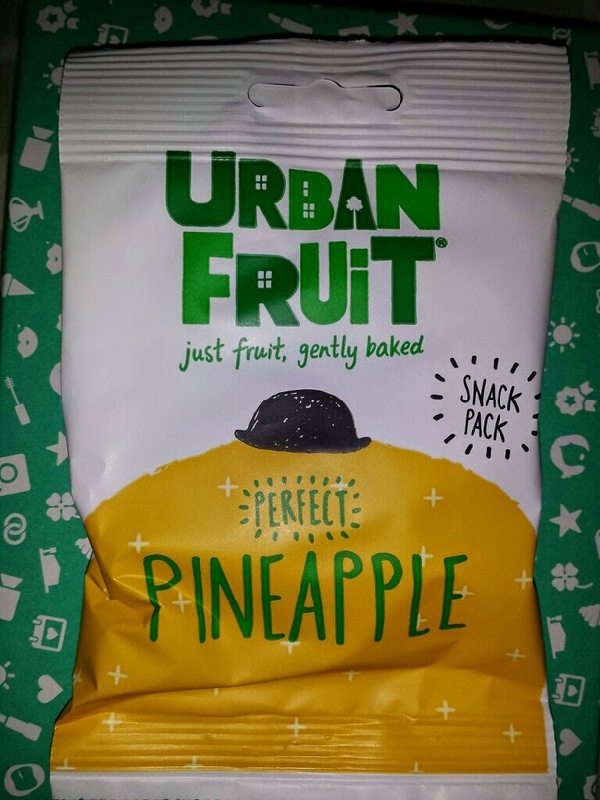 Baked pineapple, all packaged up and ready for you to munch on. I have to admit that I was pretty hungry when I opened up my box, so I didn’t resit opening up the packet and eating them. Therefore, there aren’t any photos of the full bag along with the rest of the box and so that I apologise. 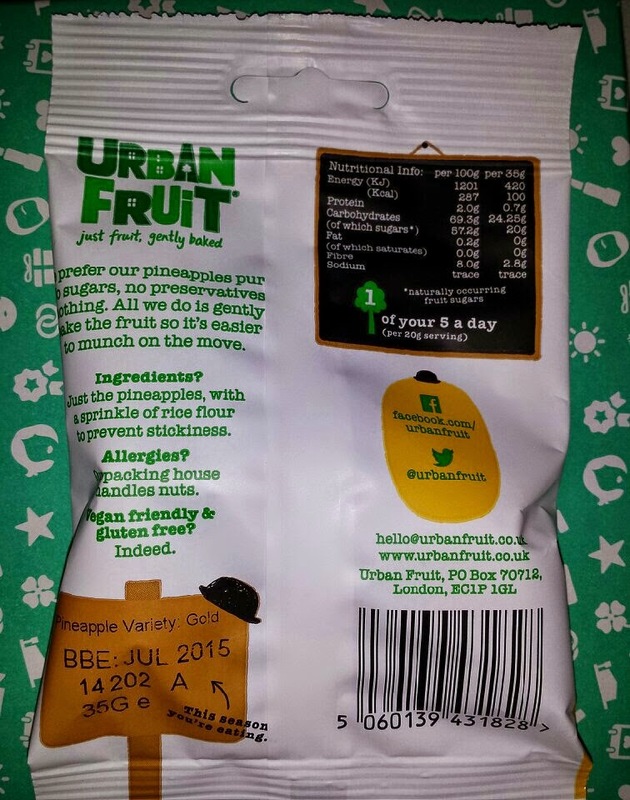 These are really tasty and also count as one of your five a day. You can buy a pack of six from Birchbox for £13.20. Pretty self-explanatory, really! This is another of the lifestyle extras included in this months box. 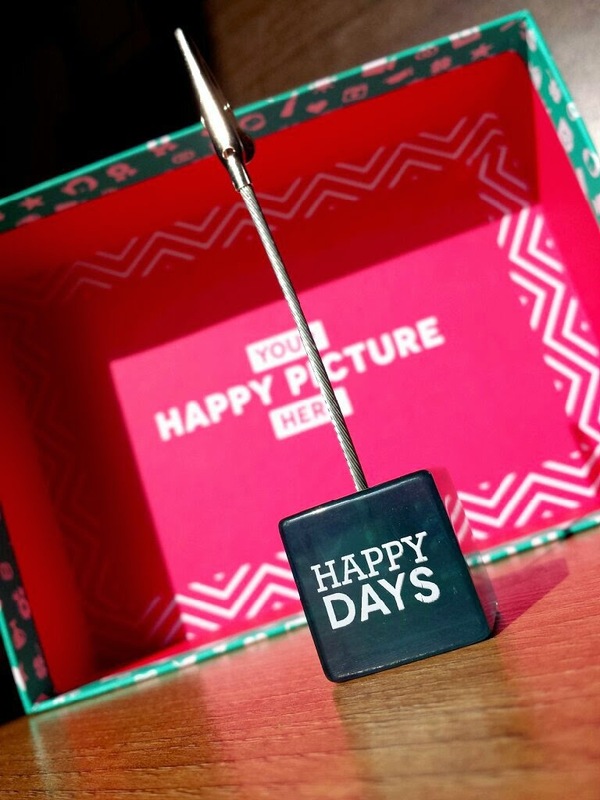 It is a Birchbox branded, cube-based photo clip for you to show off a happy snap! Always handy to have these around, you can use them at home or at work if you have a desk, for example. Mine will be going somewhere in my bedroom, either on my dresser or maybe on my shelf! Along with this, you also receive a small card with personal discounts for PhotoBox! Overall I think that this box is one of the best that I've received so far. My top picks are the BeautyBlender and the Korres Citrus Body Milk. 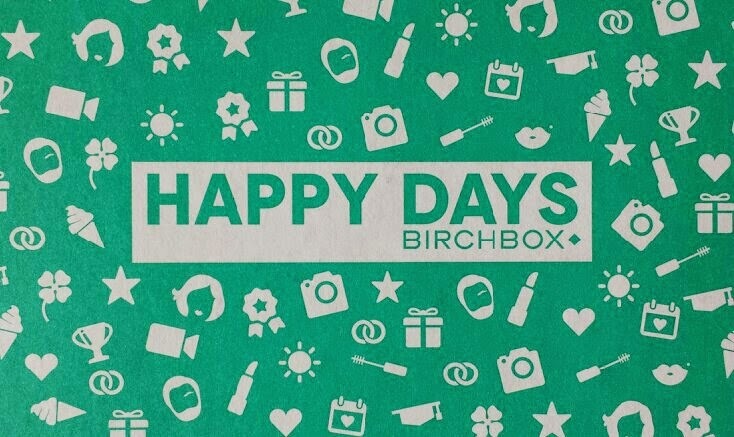 Sadly though, over the last two months I have found the delivery of Birchbox to be a lot slower than normal. I don't think that this is due to any fault of their own as my delivery tracking has been stating that my boxes are being dispatched at the same time as the others. 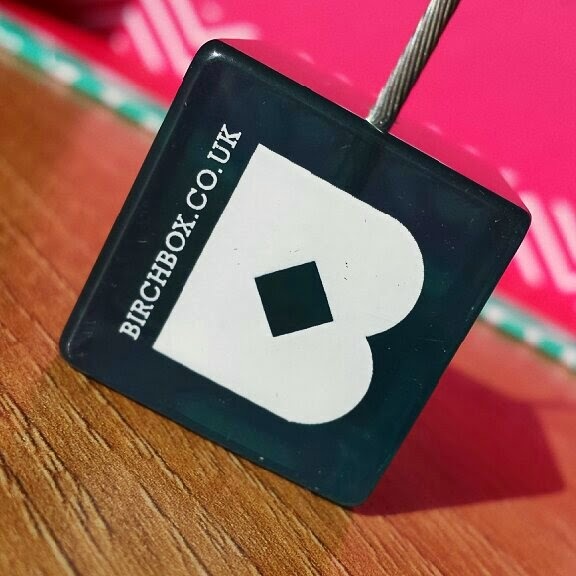 I thought that I would mention it though as it has meant that my Birchbox posts have been delayed and up a few days later than normal over the last two months. Hopefully things will be back to normal soon as everybody else seems to be receiving their boxes on time!